The Richard & Patricia Lawson Computer Science Building is looking more like home to the department. The structure has many of it's exterior walls, and the construction crew is laying brick on the West side of the building. Crews are also beginning to repair and reopen pedestrian areas closed for construction purposes. 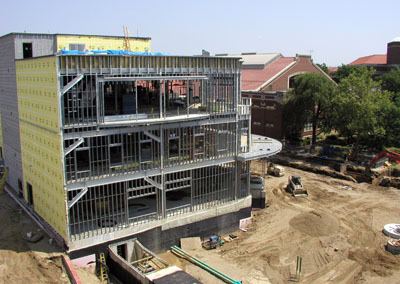 Usage of roads closed for construction of the Lawson building will resume in August. As the construction progresses, the planning team has been working hard to keep the project in motion. 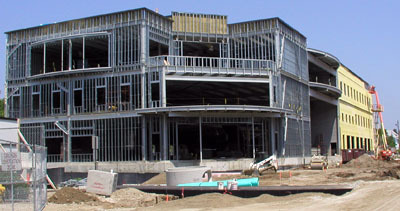 The completion date has been extended by 10 days making contractor completion July 4, 2006. The team has also determined building set up and furniture for offices and common areas. They are still working to finalize color decisions.